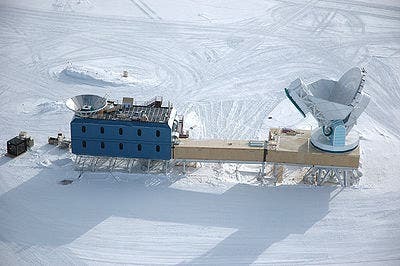 Astronomers using the South Pole Telescope reported that they discovered the most massive galaxy cluster yet seen at a distance of 7 billion light-years. The cluster (designated SPT-CL J0546-5345) weighs in at around 800 trillion Suns, and holds hundreds of galaxies. The infrared/optical representative-color image above shows galaxies with "old" stellar populations, like modern-day ellipticals, circled in yellow; galaxies with "young" stellar populations, like modern-day spirals, are circled in blue. "This galaxy cluster wins the heavyweight title. It's among the most massive clusters ever found at this distance," said Mark Brodwin, a Smithsonian astronomer at the Harvard-Smithsonian Center for Astrophysics. Brodwin is first author on the paper announcing the discovery, which appeared in the Astrophysical Journal. Redshift measures how light from a distant object has been stretched by the universe's expansion. Located in the southern constellation Pictor (the Painter), the cluster has a redshift of z=1.07. This puts it at a distance of about 7 billion light-years, meaning we see it as it appeared 7 billion years ago, when the universe was half as old as now and our solar system didn't exist yet. "This cluster is full of 'old' galaxies, meaning that it had to come together very early in the universe's history – within the first two billion years," stated Brodwin. "You could say that the rich get richer, and the dense get denser," quipped Harvard astronomer Robert Kirshner, commenting on the study. They're hunting for giant galaxy clusters using the Sunyaev-Zel'dovich effect – a small distortion of the cosmic microwave background (a pervasive all-sky glow left over from the Big Bang). Such distortions are created as background radiation passes through a large galaxy cluster. 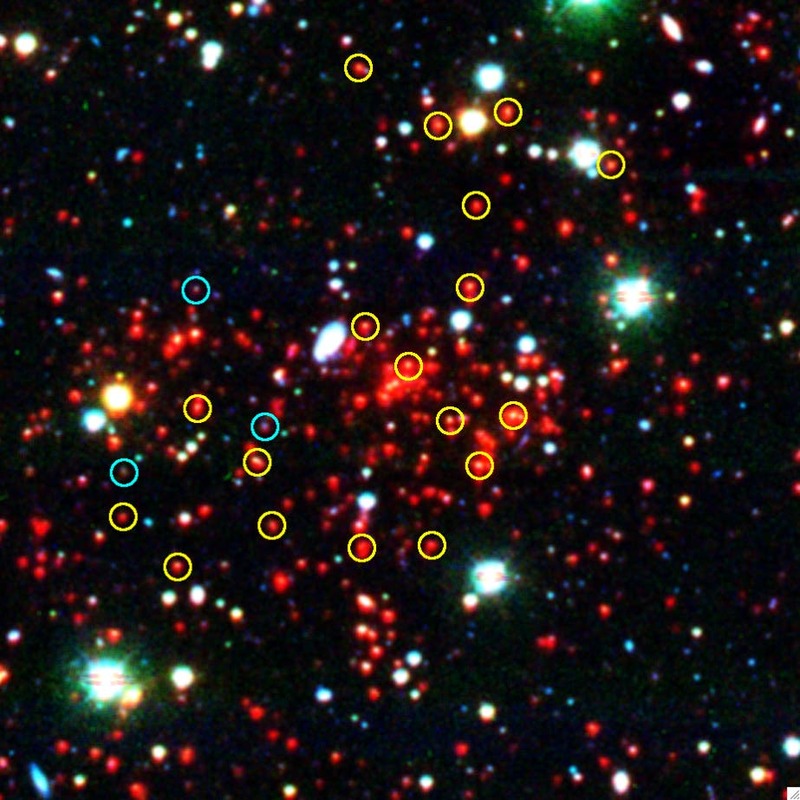 Once this distant cluster was found, the team studied it with the Infrared Array Camera on the Spitzer Space Telescope to pinpoint galaxies within the cluster. Detailed observations of the galaxies' speeds with the Magellan telescopes in Chile proved that the galaxy cluster was a heavyweight. "We are seeing something already aged and red like a younger version of the Coma Cluster from a distant, bygone era," said Casey Papovich, lead author of a new study and an assistant professor of physics and astronomy at Texas A&M University in College Station. Papovich added, "it is as though we dug an archeological site in Rome and found pieces of modern Rome in amongst the ruins." ClG J02182-05102 might have indeed been ahead of its time. Just as Rome was the world's biggest city more than 2,000 years ago with a population of about a million residents, observed Papovich – a figure not again matched until the early 1800s in London – so too was this galactic grouping an advanced civilization for so early an era in the developing universe.